This morning I submitted the finished print file to Amazon and now I’m impatiently waiting for their approval (should come within 24 hours). If the file passes their print specifications it means that next week I will be able to release both the digital version and the print book! It feels surreal right now, I’ve been working so hard this last week, way past bedtime, in order to finish the print version of this book. Since I do some print work in my day job I thought it wouldn’t be too hard to convert the book to print, but I vastly underestimated the amount of work involved in making a 184-page long, printable book in full-colour and with a fairly ambitious design. But I did it somehow! The book workspace. I used Adobe InDesign to format and design the book. You will be able to buy and download the ebook straight from my site. It will be an interactive pdf with clickable links and I’ve put a lot of effort into making it good looking and very book-like but adapted for digital screens. I’m using a third-party service called Gumroad for orders, and they have a super simple payment and delivery system that will be built in on my website, so hopefully, that will work smoothly when you order. I’m publishing a paperback book via Amazon’s self-publishing service, and it will be sold on all European Amazon sites, US and Canada. And from the Amazon US site, it can be shipped worldwide (and perhaps from the other Amazon stores too). Also a note on the list price, Amazon sets its own prices according to a complicated algorithm system, so I have no control over the actual price in the Amazon store. Unfortunately, they also don’t offer pre-order on self-published books, but hopefully, it will be available sometime the next week on all the above mentioned Amazon sites. The book is printed after you place the order, and from what I’m told, the turn-around-time is rather quick and the quality is good. 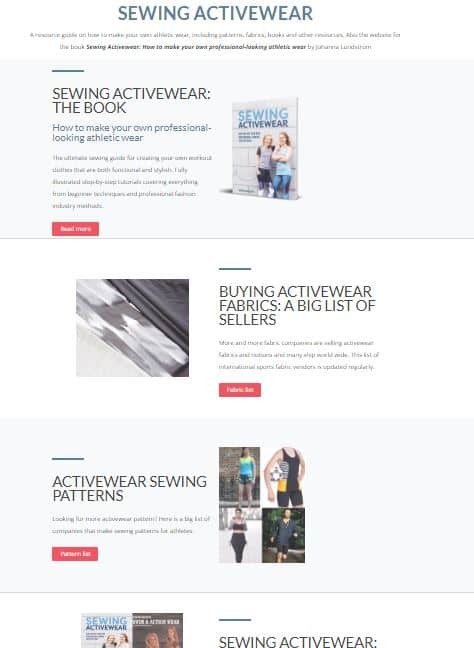 Both book formats and links to buy will be found on my new website that is also a resource for all things sewing activewear including fabric vendors and pattern companies. The list will be updated regularly and is, of course, open for submissions from you guys, I have already gotten a few new tips on shops and pattern companies that I will put on the lists later this week. And you can, of course, get a preview of the book as well on the new site. As for my current state of mind, well I’m a bit frail right now and can’t really take in that my book is about to be published. I first announced my book plans in September of 2016 and it has taken me this long for it to actually materialize. 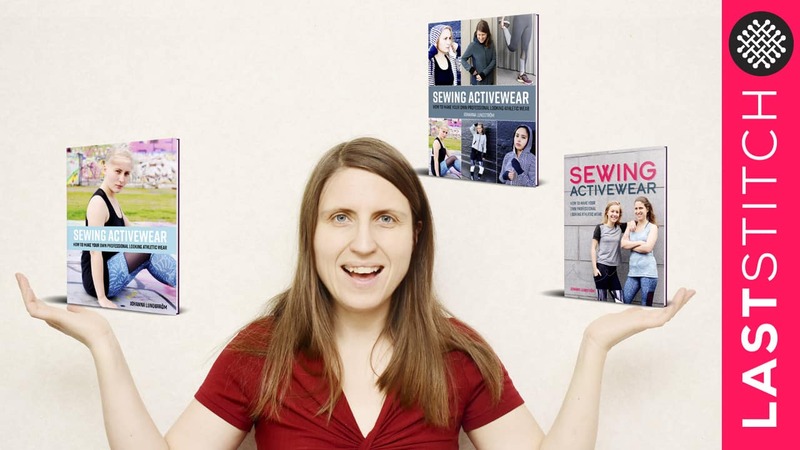 The irony is that I already have a few more sewing book ideas, but I will need to take a long break before I can make those happen! I am so excited for your book release! I’ll be buying it the day it comes out… I had no idea that Amazon ever did something like that – print after it is ordered? How interesting. Any how, the timing is perfect – I signed up for a RTW fast for 2018, so no more buying athletic wear. I will be getting reacquainted with my coverstitch machine again, and hopefully become much better at adding bindings, etc. Awesome! 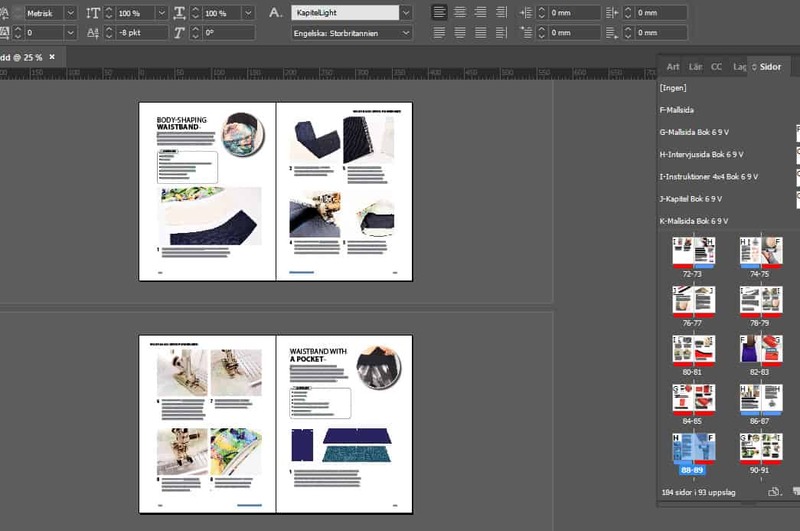 Yes the book will have a pretty extensive chapter on coverstitching with a lot of tips and tricks, plus I have 4 different tutorials for doing knit binding, so hopefully, you’ll find some useful stuff! And the Amazon thing is indeed very nifty and I like that it is lean manufacturing and no surplus printing, just copies that are actually sold. YAY! Congrats Johanna! I think I am going to have to get both the digital and the print versions! Aww, thank you for your support! I got my print file accepted by Amazon last night, so now there will be a print book available next week. I have to pinch myself! I hadn’t planned to go the print route initially, but so many have asked for one so I decided to give it a go and now I’m happy I did. So looking forward to it being available, Johanna. I’ll be keeping my eyes on Amazon for my non-digital copy. And, well done you!! Such an achievement, and I’m pretty sure it didn’t come easily – probably from tons of hard work, a lot of dedication and, at times, a big dose of self-discipline! But the (well-deserved) kick you’ll have when you see the released item in print and being purchased. Thank you! I got my print file accepted by Amazon last night, so now there will a be a print book available next week. It will take a while before it is properly indexed and such on the site, but I will get a link to it at the beginning of next week. And yes I’ve done a lot of sacrifices, especially on the social/family front this fall, and I’ve felt bad about it, but everyone has been super supportive and my daughters are also models in the book! Thank you so much, Faye! I got accepted by Amazon last night and now I have to pinch myself, it feels unreal still! Congratulations Johanna… that is SO my Christmas present to myself! What commitment and dedication. I’m so pleased for you. Thank you so much for your kind words and I’m so happy to hear that you are interested in the book. Getting all the support from you guys have helped me a lot when it comes to grinding it out and actually finish the book. Having cheerleaders is crucial for sure! Congratulations! That’s quite an undertaking, but you did it! Hi! The bra designer Beverly Johnson is interviewed in the book about this particular topic and she gives some great advice on which fabrics you need to use when making a highly supportive sports bra, in fact, she says the right fabric choice is everything when it comes to making sports bras. Plus she has a lot of other tips too. Congrats, Johanna! I look forward to getting your book!! That is great news re Amazon! I had no idea they did print to order service. I have ordered a copy already through amazon.ca but they are saying it’s not available and they will let me know when it is 🙂 I’m confident your book will have all sorts of helpful info and can’t wait to see it Johanna – uh oh more ideas for more books! Be careful the bug has you now 🙂 I for one support the inspiration 100%!